Wow. This one has proven tricky. Most of my review research goes fairly easily, thanks to Google's Skynet-like knowledge of life, the universe, and everything in it. But somehow, it disappointed me on this one. 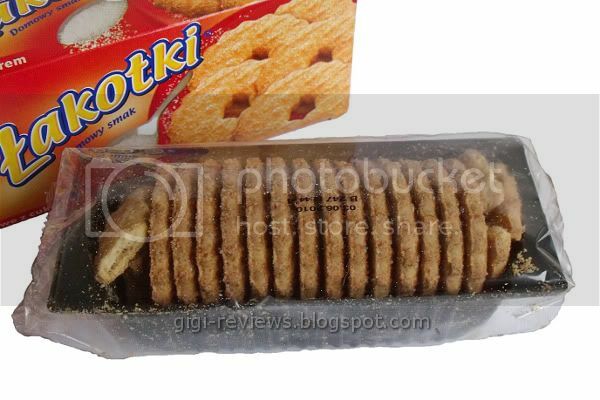 I know that these biscuits cannot possibly be all that exotic, as they are made by a brand called SAN, which is a Warsaw-based subsidiary of the French cookie company, LU. They are thus a Polish LU product, and I am sure there is a politically incorrect joke to be had there. Ciastka SAN wzięły swą nazwę od jednej z najpiękniejszych polskich rzek, zaczynającej swój bieg w dziewiczej części Bieszczad. Właśnie w Jarosławiu nad brzegiem Sanu powstają nasze produkty. O ciastach wiemy wszystko. Najlepsze składniki oraz pasja pieczenia to tajemnica wyjątkowego, domowego smaku Łakotek. Są kruche i pyszne, dlatego wspaniale umilają czas spędzany w gronie rodziny i przyjaciół. Cakes have taken name from one of fine Polish river SAN, in virgin Beshyadas beginning run part (frequent). Our products emerge in (to) over coast exactly Jarosławiu Sanu. Everything we know about pastes. 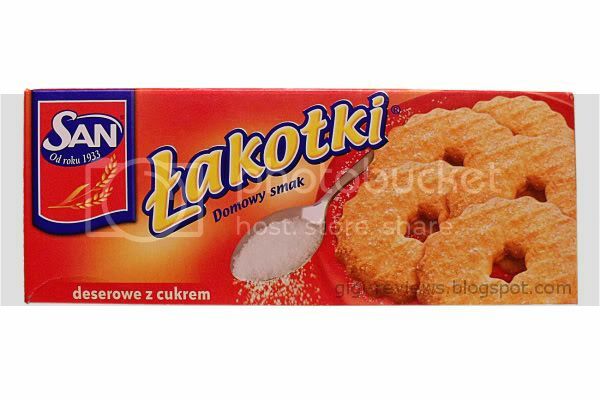 Fairest components and passion of baking it exceptional secret, home (domestic) savor Łakotek. They are fragile and proud (excellent), so, in bunch of family magnificently time (sometimes) spent umilają and friends. Ummm...sure. If any of you out there have more info you would like to share -- or better yet, have sufficient fluency in Polish to give me a less clunky translation -- please comment. What really inspired me to get these cookies was that I wanted something from the store I was in, and hey -- the box had a big spoon of sugar on it -- and how could that not be good? You see, once again, we have my not-exactly-biological-sister Net to thank for this review. Chris and I had gone to visit her in her native and not exotic land of New Jersey, and after we had safely procured more Herr's Puff'n Corn (damn, that stuff is good! ), we stopped in at a small Polish butcher shop/deli called Continental Homemade Provisions, because Chris wanted to try some of the home made kielbasa they sell. Anyway, I selected these biscuits because they looked like the most interesting of the non-deli items to chose from (and because they would travel well). 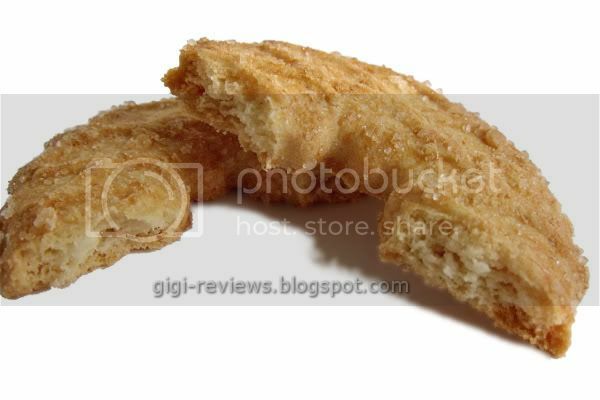 As best I have deciphered, they are simply a sugar coated shortbread type biscuit. Pretty darned basic. Like the best animal cracker ever! 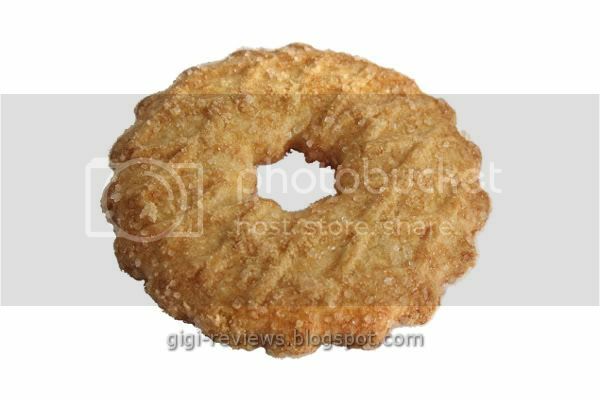 Imagine a ring-shaped animal cracker (though lighter and airier), topped with a sprinkling of coarsely grained sugar. 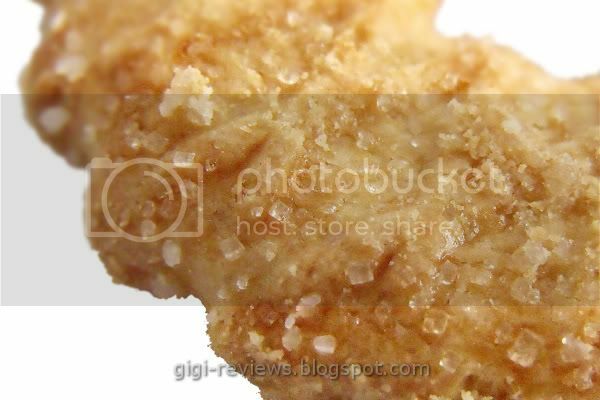 The texture is really flaky and crumbly. Animal cracker, yes, but the taste is also like a really sugary butter cookie. Oddly enough, it also reminded me of "dry" cereal marshmallows. There's a vague vanilla flavor to them that I swear sent me looking for the Lucky Charms. It's just a really simple cookie, but it's so basic that it's great -- yet another illustration of how simplicity, well executed, can equal excellence. I didn't try the milk test because they are so flaky I thought they would just mush up, and I cannot deal with a glass of crumbs. But never mind...you don't need milk with these. They're terrific by themselves. If you should see them, grab a box. In fact, grab two -- and send one to me. 481 calories per 100 grams. The box weighs 148 grams and contains 16 cookies, so I figure that's about 44.5 calories per cookie. Unless my math is wrong, in which case...oops. Smacznego! This will be the best band name EVER! BTW I just have to have a day off to get to the post office and your cookies are on the way! Too bad I just started a low carb diet. And yes, that keilbasa store is family run for well over 30 years. I refuse to eat store bought keilbasa - which is just fat put into a tube to me. Net: These are worth it once you at the point you can work carbs back in.